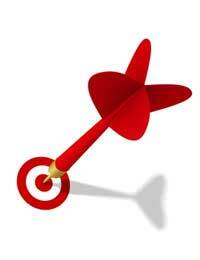 One way of fuelling continued motivation and aiming for the future is to set business goals and targets. All businesses, whether larger or small, should have clearly defined business goals in place at all times. When you’re first setting up your gardening business, you should consider your initial goals carefully and they should be included in your business plan. Business goals and performance targets are important as they give you something to focus on, both in the short and long-term, and they can help staff in all levels of the business. In fact, business goals and targets can be a very useful form of management tool, for driving performance and keeping people going, even within difficult times. When you’re creating and setting business goals, it’s important to keep several factors in mind as you do so. It’s all very well having goals, but if they’re too far-fetched and it’s unlikely you’ll ever achieve them, then they want be that motivational. Many people use the SMART principle when they’re setting goals. This stands for Specific, Measurable, Achievable, Realistic and Time-bound. Specific – goals should have a specific purpose that you can keep in mind are much better than non-specific goals. Measurable – a good goal is easily measurable in terms of how things are progressing and when you reach your target. Achievable – when you’re setting a goal, make sure that it is something you can realistically achieve. Realistic – in line with achievable, goals need to be realistic so that staff are able to take them seriously and know they are possible. Time-bound – working towards a goal is made easier if there’s a certain time in which you’d like to achieve it. Motivation will also be improved. So, when you’re coming up with ideas for new business goals – and new goals at regular intervals are great to have – keep the SMART principles in mind. Run through them during your planning process and see if all the principles apply – if not, then you may need to rethink your goals. The achievable element in particular may take some planning to get right. On the one hand, you want to challenge and motivate your staff to aim towards a goal, but on the other hand, you don’t want the target to be beyond their reach. It’s sometimes a hard balance to get right, but with perseverance and work you should get to know what is and isn’t beyond both your reach, the reach of your staff and the reach of your business. When you and your staff achieve a goal, take pleasure in the moment and share in the success of it with everyone. Future goals will be worked towards more positively and in a better light if your staff know they’ll gain some kind of reward at the end of it. This could be a monetary bonus, a treat for everyone to enjoy or a big staff party and celebration. It’s good to have goals in place on a regular basis, but don’t overdo it. Having loads of goals in existence at the same time could become overpowering and you don’t want to lose out on motivation because there’s too much to think about. Setting goals and achieving them is a great experience, so why not put the SMART principles in action today and see how they could benefit your gardening business?